My Name is Ben and I’m a dentist. This blog was made to tell my story through dental school. I was a student at the University of Texas Health Science Center in San Antonio. Yeah, its a big name, and a great school. I’m loving dentistry and dental school was certainly an experience. I was involved in lots of different dental school organizations. I was on the school leadership committee and was involved with the admission process. I interviewed prospective dental students. I even had a place on the dental school board of admissions. I have a great idea about what it takes to become a dentist. I grew up in central Texas in a big family. None of my parents are dentist. In fact, originally I wanted to be a computer programmer. I decided to do my undergraduate at BYU. While I was there I realized I liked computers as a hobby, but I wanted to do something in the health industry to help people. BYU is a great university for aspiring dentists. There are 4 prep classes to help people become dentists. I took them all. These are the classes I’ve taken on dental preparation. 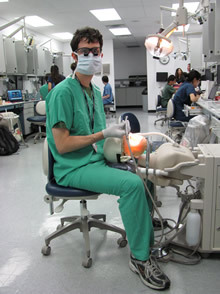 From these experiences and community service I became certain that I wanted to be a dentist. Then I took the DAT, applied, and got into the San Antonio dental school. I am really excited about being a dentist, so excited in fact, that I decided to build this website. Becoming a dentist is actually a pretty tricky process so I decided to offer some helpful suggestions. Please enjoy my articles and tips. Some of these tips are my finest, things that can really help you get into dental school or do well in your interview. I am currently a pre-dental student and I am starting my freshmen year in college. I was wondering if you know about any internships or summer programs for Dentistry? Also, I am going to apply for the Dental Early Acceptance Program of San Antonio’s dental school this coming fall semester. What advice will you give me to get accepted into Dental School? Is there any recommendations you have about getting a good score for the DAT exam? Thanks. I am on the verge of becoming fifty years old with an associates degree in Liberal Arts w a strong biology backround. I’ve worked in Research and Developement for some time in the Pharmacuitical Industry. My question is, so you think I am just too old to get started in becoming a dentist? Also is there any financial help available to someone like myself? First I don’t think it is too late for anyone to do anything. But, with that being said, the dental path is an extremely hard path. You will need 1000’s of hours of personal time devoted to studying and hard work. The path to get accepted is very competitive and due to your age you may find obstacles with acceptance. I don’t believe there is any financial aid outside of student loans, which now accrue 6.5% interest. The cost is very high and the path is very long. You would need a batchelors degree (3+ years) and a dental degree (4+ years). I know lots of people that have dropped out due to stress after getting years into the program, most already burdened with tens of thousands of dollars in loans just from trying. I know that it is possible, but unless you have no other commitments in your life, I wouldn’t suggest it for your situation. Wonderful website by the way. Quite informative and gave me the general idea and everything I needed to know. I was thinking of pursuing a career in Law although I’ve been quite interested in Biology for some time. I’m now a grade 11 high school student and I was wondering whether to pursue Dentistry or Law. I know that both takes incredulous amounts of work and time and both are hard to get in. I’m just not so sure! I’m taking Physics and Biology this year. But it would be better to take Chemistry as well right? Spend some time learning about each of these two professions. They both take considerable time and work, so find out now which will make you happier. I would highly suggest that you shadow a dentist and a lawyer. Take an intro course for both fields if you can during college. You have time so don’t start stressing yet, just try to identify what will make you happy. Check out my articles about “Why you should and shouldn’t become a dentist.” If you choose dentistry you will need lots of science classes, including chemistry. Ben, This is a fantastic sight. I’ve been trying to find out what I want to do with my life now that I’ve been working after a college stint that happened about 8 years ago. I’m now 28 and have finally decided that I want to start a new path on becoming a Dentist. I know I’m a little late in my age to finally start this process now (I just started my basics), but I really feel that this is where I want to go. I’ve been working in the freight industry for almost 10 years now and I have a wonderful sense of business and an ability with dealing with customers on a complex level. But this isn’t what I want to do with my life. I am a curious person for biology and constantly enjoy reading articles on anything to do with science. I obsess about my teeth and had orthodontic work on my teeth when I was younger that lasted for 5 years. I think working on teeth is an art and a wonderful craft. Just one question. Do you believe a person such as myself at this age can make this happen for myself? I really want to try and make this happen regardless of what it takes. Thanks! Thanks for the message. I am certain that someone your age can make it in the field of dentistry. There are multiple people in my class right now that are over 30. There are people that are married and some with multiple children. I believe that admissions takes in a few older students every year, I suspect it is to enhance diversity. While I think you can do it, I will warn you that it is tough. Make sure you take a hard load in undergraduate, because you need to be ready and prove to yourself that you can do it. Ben, I am a highschool senior trying to figure out what career path I want to choose. My counselors have been asking me what I want to be and I think I want to be a dentist. However, I am not sure and dont know what or how to tell them. Could you give me some advice? Check out my articles on ‘why to become a dentist’, and ‘why to not become a dentist.’ If you are still interested after that call around and see if you can shadow with a local dentist. This is a really good way to see if you like dentistry.